Most of my original work is for sale (unless otherwise noted): Prints of any work are also available with a 6 week delivery time. What started as a personal — and private — artistic venture is now a lucrative business for Halifax-based artist Dorothea LeBlanc. Although she graduated from Guelph University with a Bachelor of Fine Arts degree, LeBlanc took a break from art for more than two-and-a-half decades to deal with symptoms of multiple sclerosis. Her health began to improve in 2007 and, after a trip to China, her love for art began to take precedence. And as LeBlanc started being part of group shows around the province with her realism paintings, she began sneaking one or two upcycled works into her collection. LeBlanc starts with a blank canvas and attaches different household items — like old clothing, broken jewelry, screws, nails and more — with glue, then paints over everything with all the colour and texture she can find. LeBlanc says her love for the environment is what ultimately started her on her upcycling journey. 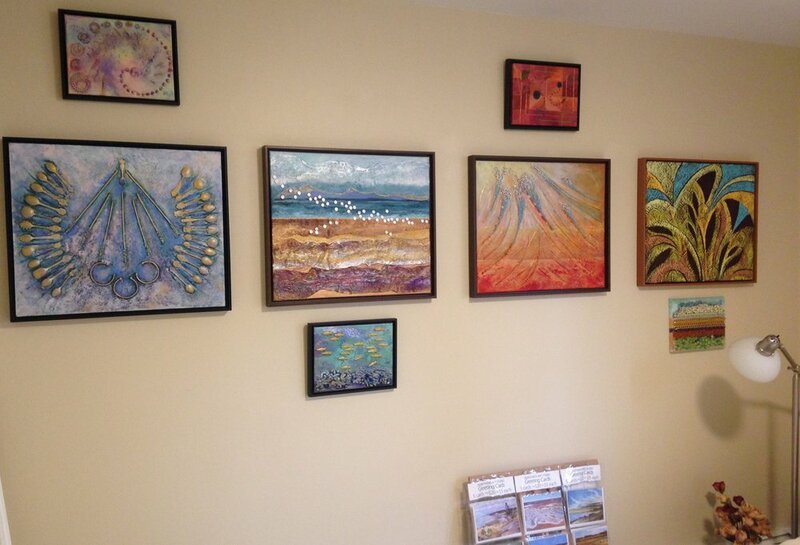 For more information on LeBlanc and her artwork, visit https://dorothealeblanc.ca (https://dorothealeblanc.ca). This is an article I wrote for The Abundant Artist blog site.